Entrepreneurship 4 Edition For courses in Entrepreneurship, Small Business Management, and Starting a Business. 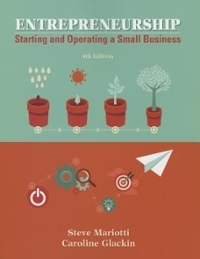 A Comprehensive, Practical Approach to Starting a Business For fledgling entrepreneurs and business students, Entrepreneurship: Starting and Operating A Small Business untangles the complex economic, financial, and professional considerations surrounding business ownership and operations. In its Fourth Edition, Entrepreneurship takes a critical look at contemporary entrepreneurial successes, allowing students with a range of business interests to engage with and draw insight from the text. Balancing real-world case studies with thoughtful instruction, Entrepreneurship leads students to develop their business plans step by step, at the end of each chapter. This approach allows students to internalize different aspects of business ownership at a self-guided pace. The authors’ combined business acumen and educational expertise make for a fluid transfer of business concepts between text, instructor, and student. Students will relish the opportunity to start drawing up a business plan right away, enhancing their experience both in and out of classroom.